Winter (which I hate), as well as Christmas (which I love), has arrived and it was time to treat ourselves to some new outdoor clothes. I had heard some good things about Stio, so I checked out their website and placed an order. 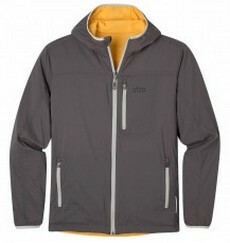 I got the Men's Second Light Alpha Jacket in Magnet as a Christmas present to myself and the Women's Idyll Merino Hooded Sweater in Charcoal Gray as a surprise Christmas present for my wife -- and I can't wait to tell you how much we love our new Stio apparel. Stio is based in Jackson Hole, Wyoming and I don't know of a better place to develop and test outdoor apparel - so you know it's got to be good. Their goal is "bring you a refreshing new choice replete with performance, creativity, and style" and from my perspective they clearly exceeded that goal. I found this quote on the Stio website and it sums up our thoughts very well: "Stio was founded to inspire connection with outdoors through beautiful, functional products infused with mountain soul. We draw inspiration from our everyday immersion in life here in Jackson Hole: days on local rivers, trails and Teton Summits. Technical performance, quality and versatility are hallmarks you’ll find in every piece of apparel that we make, be it intended for epic alpine pursuits or quieter moments of the mountain life." Unfortunately, Texas doesn't have the mountain life or the Grand Teton Summits or epic alpine pursuits, but Texas does get cold, windy, and drizzlely and we were looking for something that was lightweight, comfortable, stylish, warm and breathable for biking, hiking, and other outdoor activities like bar hopping and we found it in Stio's Women's Idyll Merino Hooded Sweater in Charcoal Gray and their Men's Second Light Alpha Jacket in Magnet. Of course, I'm a little biased, but I think my wife looks great in her Christmas present - the Stio's Women's Idyll Merino Hooded Sweater - and she seems to really like it. She loves the style, the soft comfortable material, the fit, which has a longer style, and the warm grey color - for once one of my Christmas presents won't be returned two days after Christmas. She stepped out on a cold windy day and the fixed hood and longer tunic style kept her warm and cozy. The tag claims "Our signature wool, Merino 100™ actively adjusts its microclimate according to body temperature, keeping you warm in colder temps and cooler as it heats up. It's exceptionally comfortable, wicks moisture under any conditions, and naturally neutralizes odors. The "Total Easy Care" tag means you can machine wash it as necessary without worrying about shrinkage or lost shape." And it's good looking! Hard to beat all that! DWR makes this fabric both highly water resistant and extremely breathable while maintaining excellent wind resistance. Bottom line - my jacket is stylish, warm but breathable, lightweight, easy to care for, and my wife says I look good wearing it! Which is everything I look for in a jacket! 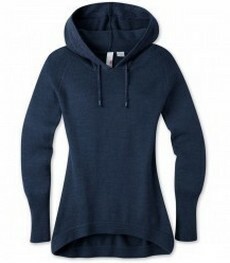 The wife love's her sweater because it's stylish, comfortable, and fits well. But we both think that we don't quite look as good as our daughter and her husband wearing our Stio! Stio keeps its guarantee simple - they want their customers to be completely satisfied with their purchase. Their products are fully warranted to the original owner against manufactures' defects in materials and workmanship. If you do happen to find a defect, all you need to do is contact customer service.